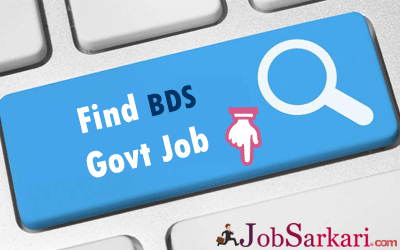 What are the government job opportunities available for BDS qualified students? Currently, the Indian employment sector is witnessing rapid growth. Moreover, this holds true for both the private and public sector in India. By observing the massive increase in the Indian employment sector, as a BDS qualified students, you should apply for the government jobs. On the other hand, it is also a widely accepted fact that the Indian Public Sector is registering growth with each passing day and hence it has become imperative on the part of BDS qualified students to secure a top position in government jobs. The government jobs always offer a high amount of security and pay-scale when compared to regular employment. Moreover, the aspect of job security is still prominent in the government jobs. MBBS Govt Jobs Check Here. Dentistry is one of the most sought-for fields of education that almost half of the students seek to go after. This popularity for dentistry streams not as much from the potential of creativity as from the central avenue to earn more significant wealth, which is otherwise, deprived in comparison to the other fields of education. Therefore, private and recently, even governmental institutions provide vacancies for these types of dentistry jobs. Several colleges have nowadays come up that offer various dentistry educational facilities including specific more secondary characteristics that vary across these colleges. It is also a widely accepted fact that the Indian government is opening up new hospitals and medical centers in all parts of the country. This is to ensure that even the poor masses can avail high-quality dental care by living in the remotest corners of the country. This is the reason that a lot of vacancies would be there for the BDS students. On the contrary, if you are a BDS qualified student, ensure that you are well aware of the eligibility criteria set by the various job positions in the government. With a slew of government hospitals coming up and more to be built in the future, it has become essential for BDS qualified students to apply for this kind of jobs. There exist a lot of opportunities for BDS eligible students to ensure that they secure a top position in the government jobs. It is also an interesting aspect to note that these jobs would be in high demand in the future for the BDS students. Here is the list of government jobs for BDS qualified students. In this job vacancy, you may work as an apprentice under a trained dentist who may be your senior. However, with a passing year, you may qualify as a senior dentist in the same hospital. This is another job opportunity which is quite high paying and offers excellent scope. As a medical officer in a dental hospital, you can show your managerial skills while supervising on other dentists. Many dental students can work in renowned dental laboratories set by the government. This would also be beneficial in enriching their minds with analytical skills.